Brian Copes drives a vehicle his students re-engineered to suit their needs. A teacher who felt like a failure when he was in school now takes delight in unleashing his students’ creativity and problem-solving skills to engineer inexpensive solutions for real-world challenges. 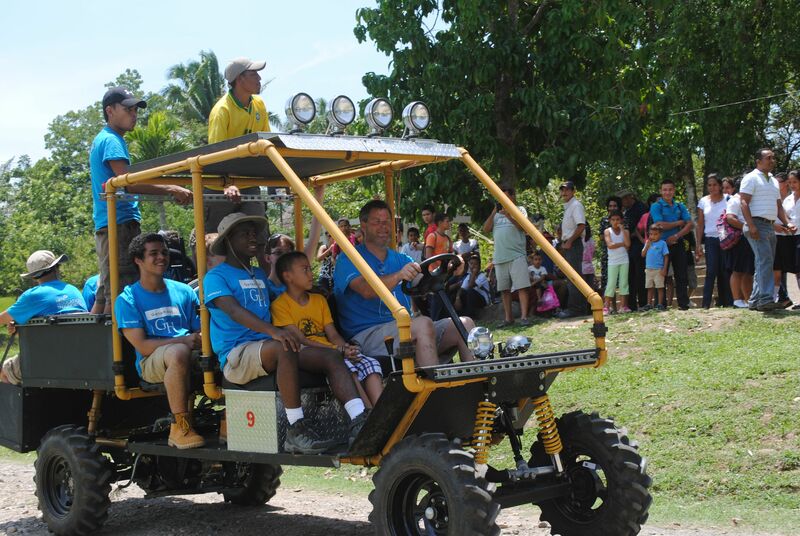 Previous classes have built three utility vehicles for communities in Honduras, along with solar panels for the classrooms that they have constructed for village children, and much more. Copes didn’t intentionally design a high school curriculum around humanitarian engineering, a field that is rapidly expanding in university departments such as MIT’s D Lab. He just wanted to give his students a meaningful context for learning. He then challenged his students to apply what experts call frugal innovation, by repurposing existing materials to design a radically less expensive solution. Students managed to replace knee and ankle joints, for example, by repurposing a used Toyota motor mount. When the prosthetics expert came back to take a look at their product, he told students, “It’s heavy, but I think this can work!” Copes asked if he could take the device to Honduras for an upcoming medical mission. Since that first prosthetic device was delivered to an amputee in Honduras, Copes and his students have struck up a long-term partnership with a community near Jutiapa. The teacher has escorted multiple groups of students on summer trips, giving them a chance to work alongside villagers and get a better understanding of local needs. On a recent trip, for instance, one team of students fitted amputees with prosthetics (which have gone through several rounds of improvements), while another taught teens how to assemble and maintain a utility vehicle that can be used to drill water wells or plow fields. The trips to Honduras have opened students’ eyes to more challenges that they can tackle. On one visit, people were celebrating the very first high school graduation of a student from their community. Most young people drop out because they can’t afford bus fare to reach the nearest secondary school. Copes and his students raised enough money to return and build two new classrooms. “Now they can teach elementary students in the morning, middle and high school in the afternoon,” the teacher explains. Each project leads naturally to the next. Once the new classrooms were built, Copes’s students designed a floating hydroelectric power plant to generate electricity for the school, repurposing a pontoon boat with a paddle wheel. Content goals and problem-solving skills are embedded in the projects. Another project involves repurposing shipping containers as vocational classrooms where students can learn welding, woodworking, engine repair, and other skilled trades. To expand the reach of one teacher with a passion for real-world learning, Copes and a board of advisors have established a nonprofit organization called Skilled Knowledgeable Youth, or SKY. The goal is to expose many more young people to meaningful STEM projects during the regular school day, as well as in after-school and weekend experiences. The SKY website features a wide range of projects that are likely to inspire other teachers, from container classrooms to the design of an inexpensive “solar suitcase” currently being used to power laptops and charge cell phones in a refugee camp in Kenya. Teachers looking for global education opportunities will find natural connections to the Sustainable Development Goals of the United Nations. For more information about bringing the global goals into your classroom, visit TeachSDGs or follow the hashtag #TeachSDGs. Copes has earned accolades for his innovative teaching, including recognition from the Global Teacher Prize and LifeChanger of the Year, but his methods are straightforward enough for any teacher to borrow: Tap into students’ strengths and interests, connect their learning with the real world, and believe that they can succeed.